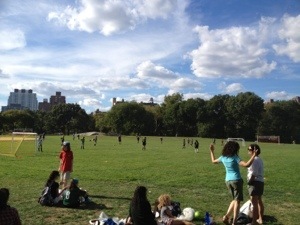 Earlier in the season, before the storm, the days were brighter and warmer, and the girls played soccer in Central Park. Look how much fun these soccer moms are having! The term, ‘soccer mom,’ is used disparagingly, but I appreciate the soccer moms and dads who coach teams and bring snacks and stand there in the cold, cheering and chatting, without warm beverages. I appreciate myself. I put air in the girls’ tires so we could ride bikes to the game. But I was overambitious. It was too cold. We were miserable, riding into the cold wind off of the Hudson River. The girls would’ve rather taken a bus, a subway, a taxi, anything. Getting places in New York can be cushy or tough. Sometimes I make us tough it out. Perhaps needlessly. Sometimes I feel like I am an Outward Bound leader rather than a parent. I want to be grateful that my kids are so athletic and like playing team sports. I have so many good things on my horizon. I want to focus on positive things and my upcoming goals. I do not want to dwell on the argument the girls and I had when it was time to ride home from the game and the girls wanted to switch bikes. Wonderful things I can’t even imagine right now. That’s my upcoming goal until New Year’s — to have faith in the power of pronoia. < Previous Want to Run Away? Oh. And bless you for being a soccer mom in NY. I’ll never complain about it here in NC again 😉 Although – my tenure as a soccer mom was in Philly. So I guess I know part of your pain. Especially spring ball that started in March. Aw, NYC is a fun place to be a soccer mom (except the end of season)! I am just happy we can move indoors now for basketball season. I will not miss the numbing cold!